The National Broadband Network (NBN) is widely considered to be failing Australians, but it isn’t failing them equally. Our research, undertaken at the Centre for Research Excellence in the Social Determinants of Health Equity, seeks to address health inequities by looking at the geographical distribution of infrastructure, including digital technology. Examining the rollout of NBN technologies as of December 2016, our preliminary analyses suggest areas of greatest socio-economic disadvantage overlap with regions typically receiving NBN infrastructure of poorer quality. To determine socio-economic disadvantage, we used the Australian Bureau of Statistics’s (ABS) socio-economic indexes for area (SEIFA) and its index of relative socio-economic advantage and disadvantage (IRSD) from 2011. Across Australia, we found only 29% of areas with a SEIFA decile of one (the lowest-scoring 10% of areas) had fibre-to-the-premise (FTTP) – considered the best broadband technology solution available – or fibre-to-the-node (FTTN) connections. So far, around 71% of the NBN technology available in these areas involves inferior options, including hybrid fibre-coaxial (HFC), fixed wireless or satellite technologies. On the other hand, 93% of areas with a SEIFA decile of 10 (the highest-scoring 10% of areas) had FTTP or FTTN. This result tells a similar story to an early analysis by Sydney University’s Tooran Alizadeh of 60 NBN release sites that were announced in 2011. She found some of the most disadvantaged areas of Australia were not gaining equal access to the new infrastructure. 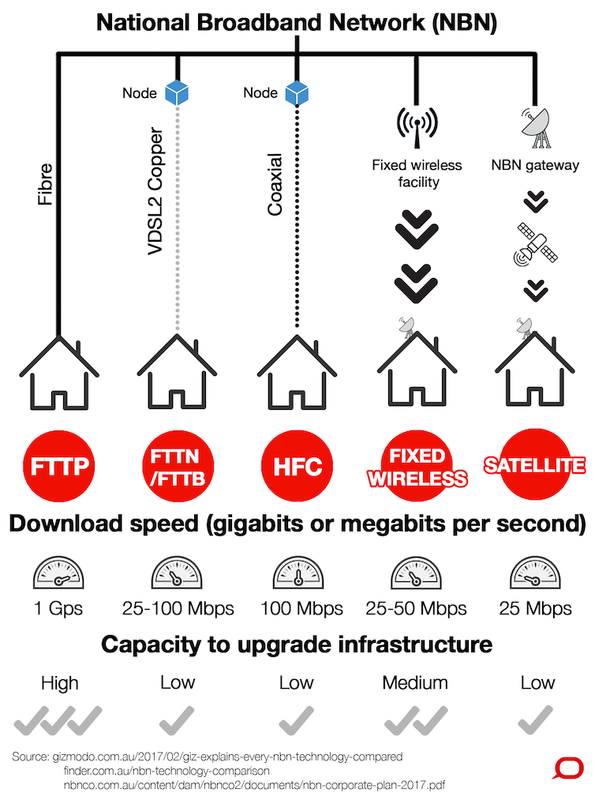 If we look only at major cities in Australia – where the level of fibre technology is higher overall – areas with the greatest disadvantage, while exceeding similarly disadvantaged areas nationally, still received significantly less FTTP and FTTN: 65% of areas with a SEIFA decile of one had FTTP and FTTN, compared with 94% of areas with a SEIFA decile of 10. Of course Australia is a large, sparsely populated country, which makes the business case for rolling out fibre difficult in some regions. Nevertheless, inequitable access to NBN technology appears even when controlling for the remoteness of the location. If we look at outer regional Australia where fibre is less prevalent, the pattern looks worse. Only 12% of the most disadvantaged areas with a SEIFA decile of one received FTTP and FTTN, compared with 88% of the most advantaged outer regional areas with a SEIFA decile of nine. Receiving FTTP or even FTTN may still be better than receiving HFC, fixed wireless or satellite technologies. While HFC may be able to match maximum speeds of FTTN, this is unlikely to happen during peak times when the increased number of users sharing the same data capacity will slow service considerably. And, similar to FTTN, these technologies provide fewer opportunities to upgrade capacity to meet future demand. However, given only a limited data set was made publicly available in December 2016 by the NBN company, it is difficult to determine exactly which services are currently installed where. For example, the data set we used does not differentiate between FTTP and the lesser FTTN connection. It also aggregates some NBN technology into an “other” category, making it impossible to distinguish between HFC and satellite service. The NBN company offers a “check your address” search for its most up-to-date rollout information including technology type, but was unable to share this information with us in a single, usable data set. A NBN spokesperson said the network was being rolled out across Australia regardless of any socio-economic mapping. A faster internet connection is increasingly central to people’s social connections, education opportunities, employment prospects and ability to access services. This was raised in a 2011 report by the parliamentary Standing Committee on Infrastructure and Communications. It emphasised the potential role of the NBN in enhancing greater equity in digital access to services in regional and rural areas. The Committee heard that, due to the ‘digital divide’, many of the Australians who could benefit the most from broadband currently have the lowest levels of online participation … The extent of accompanying measures implemented by governments will determine whether the NBN narrows or widens this digital divide. Previous research has also found that people from lower socioeconomic groups are already restricted in their use of digital information and communication technologies. This can limit their access to a range of social determinants of health. When populations already facing disadvantage receive poorer quality digital infrastructure, those with the greatest need will continue to slip farther behind. Equity must be at the forefront of the NBN company’s considerations as it continues to roll out across Australia. Further entrenching social inequities through digital infrastructure is not the NBN anyone dreamed of. Note: The “contention rate” section of the NBN technology infographic on this story has been updated to improve clarity. This entry was posted in Australia, Internet, news and tagged article, Australia, digital, divide, Internet, National Broadband Network, NBN, news. Bookmark the permalink.